Started off with a leisure morning in pre paration for another walking day. We walked over to the fresh market and shopped for produce and looked at all the stalls. 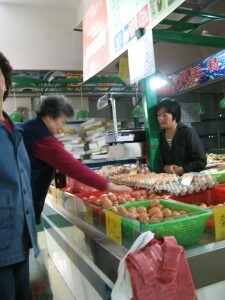 Everything from cooked food, to fresh meat, fresh fish and shellfish, eggs, dry goods, nuts, mushrooms. Every one was very friendly. One woman gave us a couple persimmons. On the way back to the apartment we got some hot chestnuts. A little too dry for me. We took the ferry across the river and walked along the Bund. There are vendors all up and down the river walk. They are not legal, so when the police drive buy you see this major flight into hiding until they are gone, then the vendors come back and continue with the hawking. The Bund is a striking contrast to the modern buildings surrounding it. I was disappointed that we couldn't view the Peace Hotel as it was totally closed for renovation. 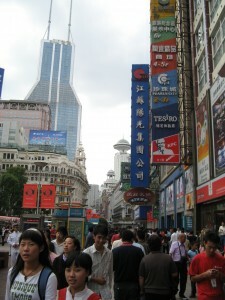 We then walked up Nanjing Road, the main shopping street in Shanghai. Carol did some shopping. The streets were packed with people. It's Sunday! We stopped at a Starbucks in a big department store and had coffee and a tuna sandwich. Stopped in another market store and got the nut bars that we like. We then jumped on a bus and drove to the YuYuan Gardens. It is another shopping area, where we did some more shopping, combined with some fantastic Chinese gardens. Some very beautiful architectural and landscaping work. We then walked back to the ferry, going through an area that is still like old Shanghai used to be like. 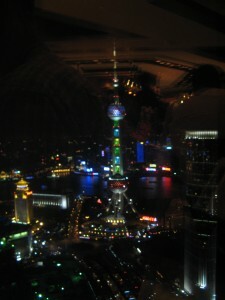 In the evening we went out for dinner to celebrate my birthday on the 56th floor of Jin Mao skyscraper. What a view! The Bund The most famous street in Asia during the first half of the 20th century, this embankment was where the foreign powers who entered Shanghai after the Opium War of 1842 erected their Western-style banks and trading houses. Today it is a veritable museum of architecture featuring building styles from Art Deco and Gothic to late Renaissance and classic European. It's also home to some of the swankiest shops, restaurants, and bars in Shanghai. Yu Yuan (Yu Garden) Billed as the most complete Chinese classical garden in urban Shanghai, Yu Yuan can be interesting for those who've never seen a Chinese garden up close before, even if you have to fight your way through the tourist throngs. It's full of rockeries, ponds, bridges, and pavilions all laid out to simulate a microcosm of the universe. Allow at least an hour. When you exit Yu Yuan, you can wander some more through the thicket of shops or head south to the aforementioned Shanghai Old Street to do a spot of souvenir shopping. At the western end of the street at Henan Lu, you can catch a taxi back to your hotel to freshen up. Jin Mao Tower Take the elevator up to the 88th floor observation deck and treat yourself to 360-degree views of Shanghai old and new. You can also take a peek inside the highest hotel in the world, the Grand Hyatt, located on the 54th to 87th floors, though hotel elevators are situated on the south side of the building.